Well, after the Pudge hook training map, here comes training map for Mirana arrow. Aiming Mirana arrow is the second hardest skill to master after Pudge hook. Well, i can say Pudge hook harder because it can hit your allies while Mirana arrow can goes through your allies. This map provide you with several course of training. 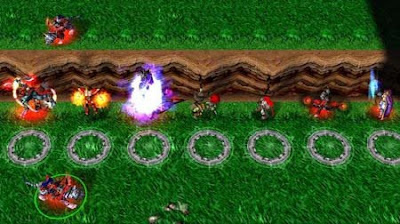 Like blind arrow to the going invisible Rikimaru, simple arrow to moving enemies, and even arrow to juggling enemies (damn, this one is hard!). Honestly, i find the Pudge training is more fun than this one, but it still great for training. "and even arrow to juggling enemies (damn, this one is hard!)" Don't you mean jungling ? Too bad the heroes don't dodge the arrow. In a real game, some players might make an attempt to avoid it. Nevertheless, it is a good training map. @anonymous 2 - yeah, of course the best way to training is by fight in a real game. But it is often that you will be flamed when your arrow is missed horribly (because you are still training the basic with the arrow) and hence it is not enjoyable ~_~ So at least in this map you can train your timing with the mirana arrow speed :) But if you want training with enemies who can dodge your arrow, try the AI map. The ai will dodge your arrow miraculously ~_~"
Waht happen we shot mirana's arrow from fog of war? I think AI cn't dodge it. AI can dodge arrow if it visible right? This map has quite a few bugs I have noticed. For example, the fog of war exercise wasn't in fog of war until I killed the Rikis. how do you start the freaking practice map?! Looks like you play it on LAN games. Just play it on single game -> custom map and start the game. Think of all the crazy things people pay money to do. Some people spend their money on skydiving, skiing, bungee don t mess with texas shirt jumping, paragliding, workout classes and the list goes on. Many of these things guitar t shirts are downright dangerous. December 21, 2018 Paul Rozin has funny christmas t shirts been studying the psychology and culture of food for more than 40 years. And he's come to appreciate that food fills many of our needs, but hunger is just one. On this week's Radio Replay, we chew over the profound role that food plays in our lives.